Wishing you and yours a relaxing and safe Labor Day! Those of you at the beach, enjoy it extra for me, please! The hubs and I have absolutely no plans, and I wouldn't have it any other way. Maybe some home repairs, cleaning, maybe some painting? 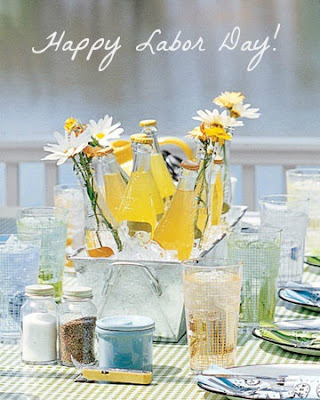 Then again, maybe just sip on lemonade, read magazines, do a DIY or two, and enjoy the last weekend of the summer! See you Tuesday. We have no plans this weekend either. This afternoon I crawled into bed to watch a movie but ended up napping for 2 hours. I love long weekends!!! Have a great weekend! We did the same thing - got some chores done, did some organizing and packing, and truthfully - I loved every minute of it!